This whole trip to Europe was a little last minute. We decided to go a month before we left and we didn’t really have a plan. I managed to rent out our Bali house to some friends I had made through an online travelling families group so the Bali side of things was fine, however we really weren’t sure where we were going beyond Cambodia. In fact we only had a oneway ticket into Cambodia until about a week before we left! Through the wonderful online world, another friend who I hadn’t met (but since have) sent me a message asking if I was interested in Housesitting in London for two weeks. I had never even thought much it and really didn’t know anything about how it all worked. Thanks to the internet, an hour later I was a little wiser. Initially I was very skeptical about whether anyone would let a family with two small boys look after their home, however through numerous chats, emails and Skype calls we managed to alleviate any concerns and so booked it all in and off we went. Both the owner of the house and the owner of the housesitting company I went through were very helpful and supportive and if I had any questions they were always available to answer. 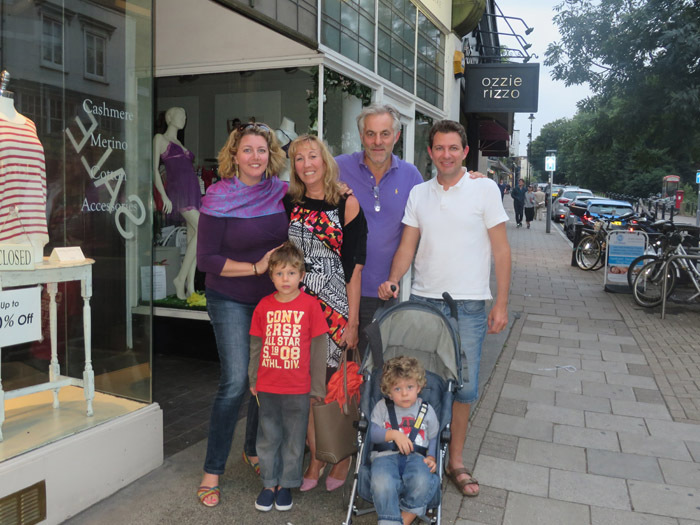 The beautiful home we looked after was in South London in a lovely leafy suburb. 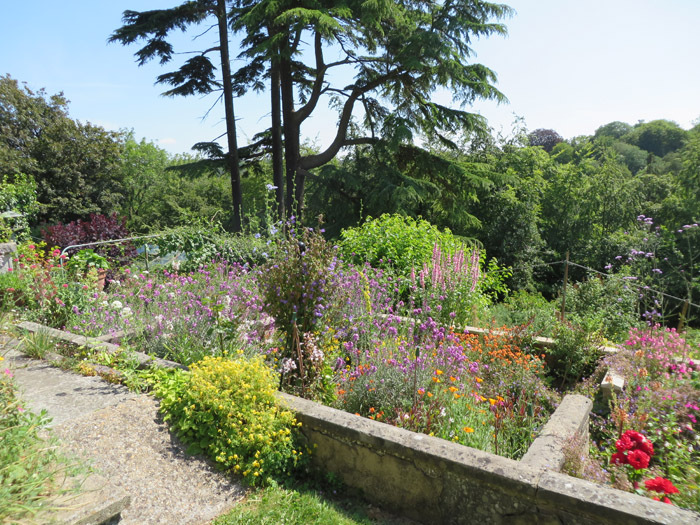 We had a huge garden that needed to be watered and looked after as well as a massive berry grove. 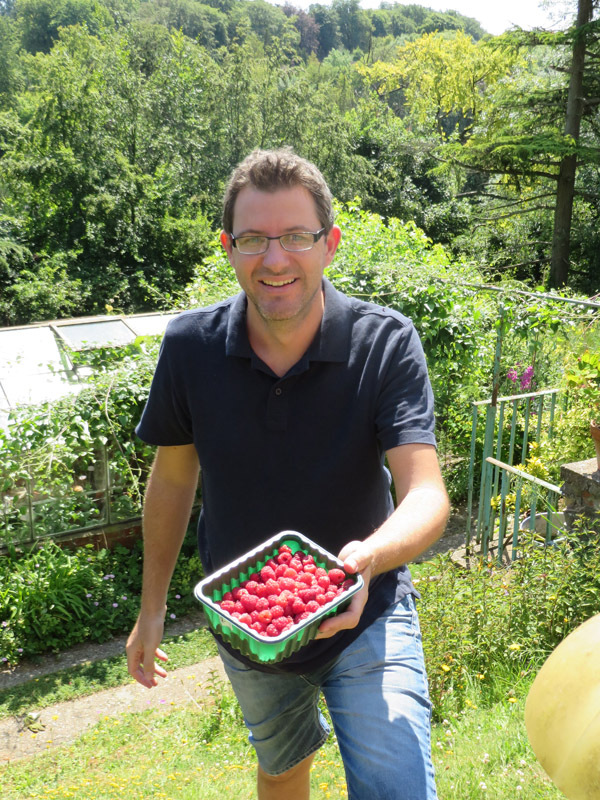 I had never picked raspberries before, however they are one of my favourite fruits, so this was something I was looking forward to. The gardens were divine and most of the time the weather was beautiful. 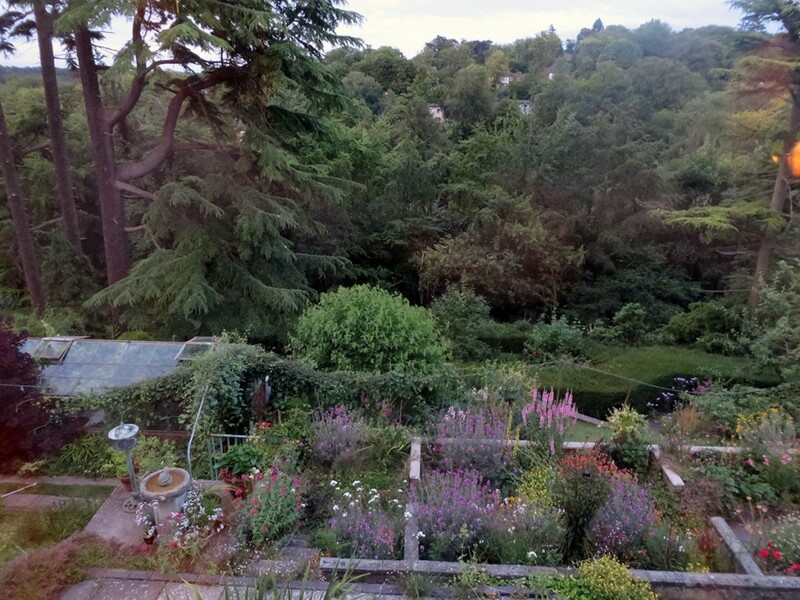 The is the view from our bedroom window across the garden and into the valley. Yes it really was that pretty! This was taken at 9pm at night! The boys delighted in running around on the huge lawn and playing with the sprinkler. Seeing them squeal with delight while they had so much space, made a small part of me yearn for a typical Australian house with a big backyard with a sprinkler for them like we used to have. 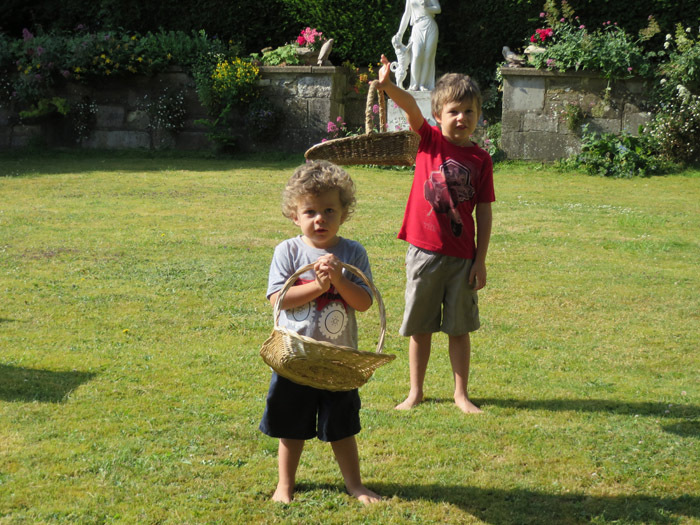 The boys LOVED picking berries with us, however they weren’t very productive. 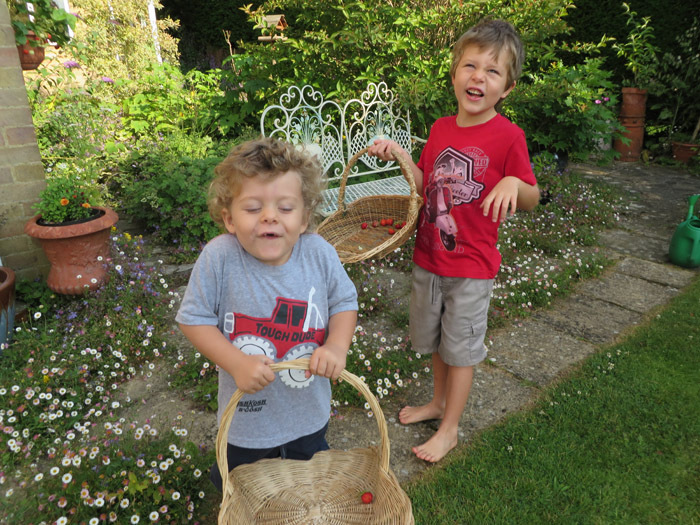 Most of the time the berries didn’t make it into the baskets and ended up in their mouths! 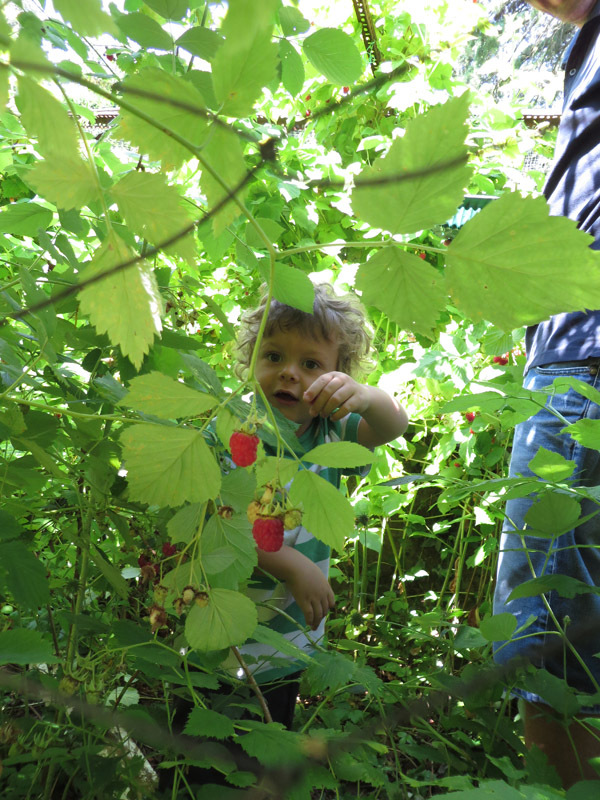 Milo also loved to come and play in the green canopy and find secret berries hidden under leaves. 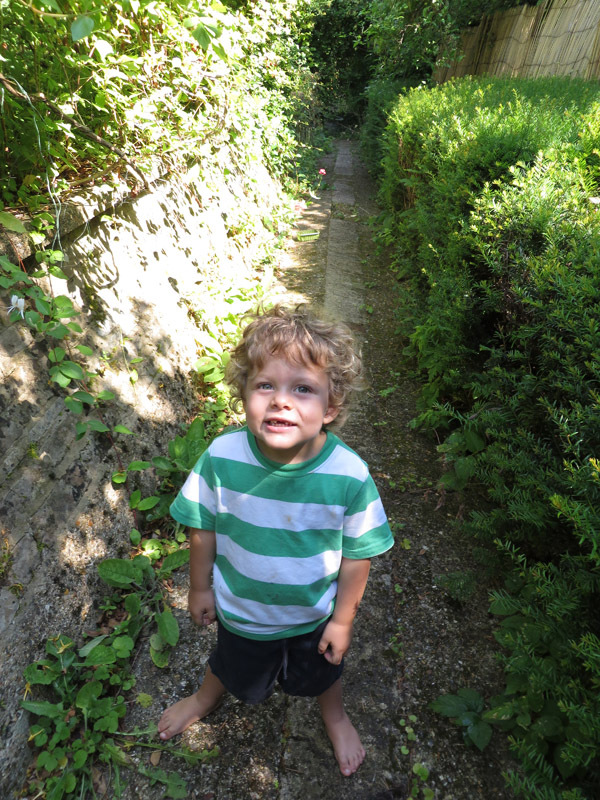 It was so wonderful to let the roam around the huge terraced gardens and play in secret spots. 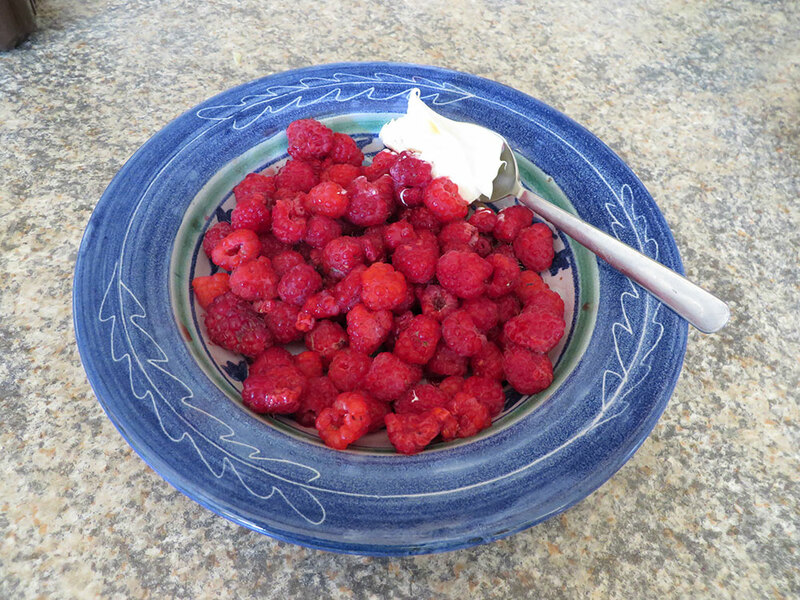 Fresh Berries and clotted cream! Possibly one of the yummiest combinations on earth! We came to England for a holiday when I was 12 and spent quite a bit of time down in the southwest. I have vivid memories of clotted cream (and thatched roof cottages) and so this was a lovely little trip down memory lane! Well for something that wasn’t planned and certainly wasn’t sort after, it has potentially changed my life and readjusted way we are looking at travelling in the future. We have since managed to book in two other housesits. We were able to take the next ones because we had no plans and they came up at the last minute. However lots of people book them in months in advance. I am so grateful to be travelling in an age where the internet is such a wonderful source of information and communication barriers are removed in many situations. I spoke with a few different people in France about housesits, 2 of them didn’t speak English, but thanks to google translate we were able to send 4 or 5 emails each and work out if the situation was going to work for both sides. I am also incredibly grateful for online groups and friendships. Without these I would probably still be in Australia. If I hadn’t had the ability to connect with people travelling with their children around the world I might have never left! Scott and I have marvelled at the difference between this trip and the one we took in 1999/2000 where we wrote one email a week on an old computer in an internet cafe, took photos with film (we carried 30 rolls of film home with us and had to wait a week to see our photos) and lugged a lonely planet guide around with us. Now we chat with friends from all corners of the earth on a daily basis from our phones, lightweight laptops and other devices, upload our digital photos each night and check sites like trip advisor for reviews on hotels, apartments, restaurants and attractions to see if they are worth he trip. We funnily enough still carry the lonely planet guide (old habits die hard) as it is always a great read. We are also incredibly lucky to work online as it means we can moved about as we please. As long as there is an average internet connection we are there! We have all really enjoyed being able to take our time in one place and not feel rushed to go our and do 5 new things each day. 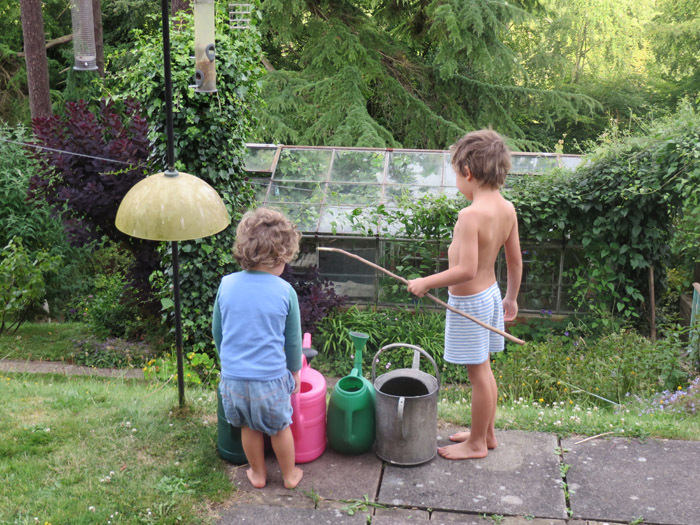 Housesitting has allowed us to move slowly (which is so much nicer when the kids are little) and to have quiet days. The kids are happy because they get to settle in somewhere for a bit and get used to a place. For anyone who is thinking about it I would urge you to try it out. It is not for everyone, however it is lovely to be able to step into someone else’s shoes for a week or two and see how they live. If you are considering travelling for a medium or long period of time it can be a lovely way to break up periods of travel. If anyone wants to know anything then please leave a comment and I’ll get back to you. Housesitting: Free. I had to sign up to Housesitmatch a great housesitting website to get access to the owners details which was about 40GBP. The utilities (including internet) are paid for by the owner if it is short term. Some of the 6 – 12 month offers I have seen sometimes ask you to pay utilities. 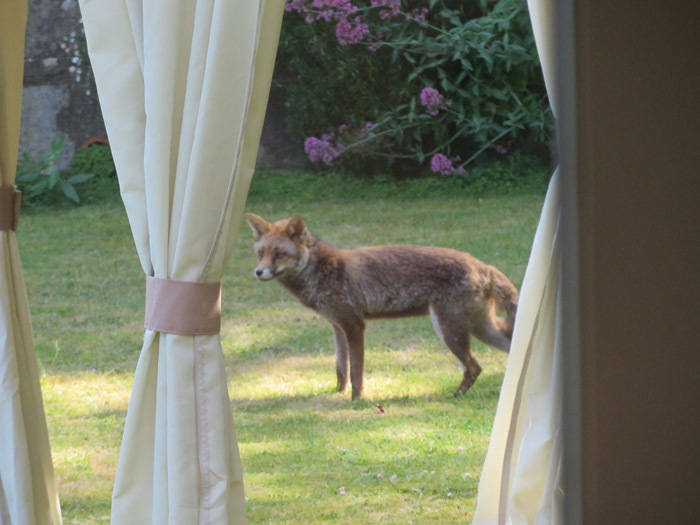 This beautiful fox used to come to the house each day and have a snoop around. He was very timid and so lovely to watch! I am so glad you literally fell into this awesome lifestyle. Lovely pics and blog too. Yes it was a very fortunate stumble! I can’t believe how many doors it has opened. Changed the way we are looking at travel! I love how you made last minute plans and everything worked out. I have to admit I am a little jealous of the spectacular pad you were able to housesit at. There is nothing better then forging for fresh fruit!! Makes me want to head out on another vacation. It is nice to see how you were willing to try something new in order to make the vacation perfect! Christa it really has opened our eyes to a whole new way of family travel. 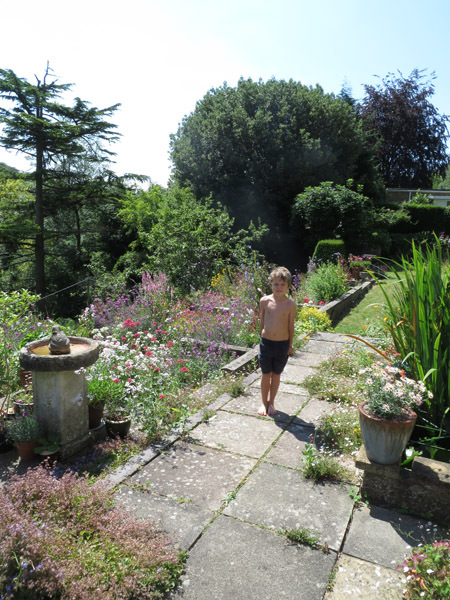 Since we left London we have housesat twice more and LOVED it! I love looking after other peoples pets and love having a space that is not a hotel or serviced apartment! Those berries look incredible, you must’ve had some very good, acidic dirt, they thrive in that. Great crop! They were so good! 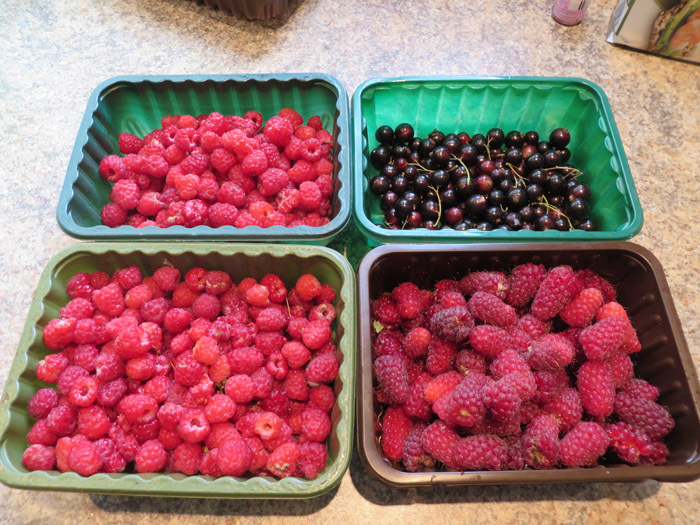 Although if I ever pick another Raspberry it will be too soon. From now on I have a new appreciation for how much effort that goes into a punnet from the shops!